The "Slow Water" Movement: Can we Heat Vermont Homes with Invasive Buckthorn? What do invasive plants have to do with keeping people warm? Potentially a lot! Buckthorn wood is fairly hard, but as a shrub or small tree is not useful as a commercial timber wood. I don't see any reason why we can't burn it, though. The larger limbs and trunks could be burned directly, in most cases without having to split them. The smaller stems could be useful too, but tossing handfuls of twigs into a woodstove is not a realistic option. One friend suggested that perhaps the twigs could be bundled together like straw was in Laura Ingalls Wilder's book The Long Winter. Another friend mentioned that smaller twigs could possibly be converted to wood pellet fuel - much less labor intensive and perhaps more realistic, though it requires processing. I'm not all that familiar with the process of making wood pellets though, and the site above claims that including bark in wood pellets causes them to be of lower quality. Removing bark from twigs is definitely not realistic. I'm not also sure if it would be possible for a small grassroots project would be able to manufacture these pellets. One thing that is important to remember is that our goal would not be to initiate sustainable long term removal of buckthorn. Our goal would be to find a short-term solution to solve an ecological and economic problem while moving on to something better in the long term. If we can get a handle on buckthorn, our next task is to transition into longer-term sustainable forestry, which would mean transitioning to using sustainably-harvested products of healthy forests in the places where we remove buckthorn. After all, native hardwood trees DO make better firewood than buckthorn, and restoring a more natural ecosystem as a working landscape is a better prospect in the long run. So, here's where YOU come in. I haven't done extensive research on this idea, and I thought it would make sense to ask people in Vermont (and other cold areas of eastern North America) what they think. 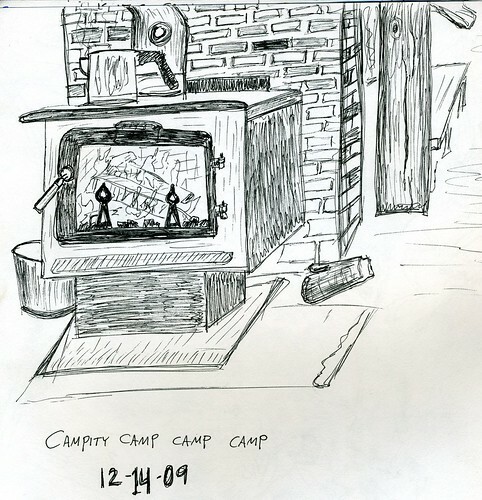 How many of you use a wood stove as a major part of your winter heating, or would be able to do so? What is the smallest diameter 'log' that is feasible to use in a wood stove? Can wood stoves be designed to burn smaller-diameter wood more efficiently? Do any of you heat with wood pellets? If so, where do you get them from? Are there local people making wood pellets, or do they require a difficult process to create and require a huge factory? If you're a landowner or land manager, would you 'donate' your unwanted buckthorn to keep people warm? Can a snowmobile be used to tow wood out of the forest during times when the ground is frozen? I'd love to start a discussion about this if anyone is interested or has ideas. 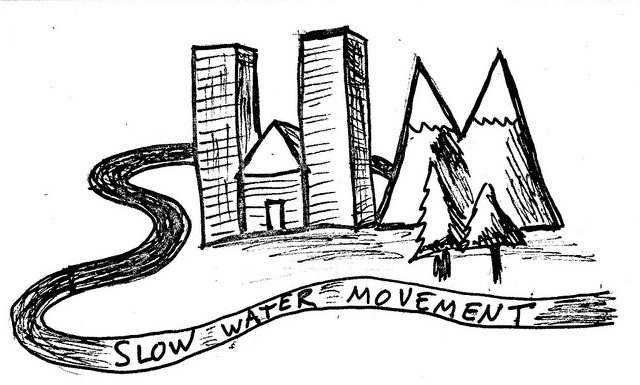 Please leave comments here or visit the Slow Water Movement Facebook page or Google+ page and share your thoughts! If the idea gathers any interest at all, I may try to push it along further - it may be too late for this winter, but winter is a great time to harvest wood to be used next year. We heat entirely by wood. You should try burning buckthorn! Or, maybe I will come get some at some point. I was on a walk on part of the TAM with lots of buckthorn yesterday and much of it is over 2" diameter. A lot of it is standing dead, so I grabbed a log to try burning. I'll post the results in this blog later - right now it is drizzling and 40 degrees so I don't feel like trying to start a fire. Perhaps you are getting snow instead up your way. We're a long way from Rio here, and despite the mild winter, it's significantly more blizzardy here too. I don't think very many people reading this blog entry are looking for apartments there. Vermont also doesn't have a seashore. These spam bots are weird. Hello! I'm chiming in many months after this blog was started but I'm very interested in the topic. I'm a science teacher and a low impact logger from Maine who has spent a great deal of time trying to eradicate Glossy Buckthorn from a local resident's land. While I've ended up chipping a lot of it to improve his ski trails, a lot of it goes unchipped and left in slash piles as per the land owner's request. We have an increasing number of buidlings in Maine that are being heated with chip boilers and it would seem that this could be a worthy use for this invasive. I will be taking some of the larger species home with me from now on for use in our stoves and will be talking about its potential value at the Common Ground Fair this weekend. A lot of the buckthorn I cut is between 2 and 10" in diameter. Yep. 10. Thanks for the conversation. Yeah, they get huge sometimes... I'm sure those big ones would burn just fine. I tried some smaller sticks last winter and they burned warm, but very fast. Let me know how it works for you! I have nearly a half cord of buckthorn cut, split and drying for next winter. Would love to have a full cord for the shoulder seasons. Very good density but a lot of work for the amount of wood I'm getting. Still, it's free and will be worth the experiment. Am guessing that the BTU value per cord is equal to or better than red maple. We'll see. Stay tuned. By the way: I will likely burn it in one of our two small stoves, both Jøtul: a 602N and a Nordic. We have another small boat stove for one of our rooms that measures only 1 cubic foot in size. I'll feed buckthorn chunks into it to see how that works. I look forward to hearing how it works! We just got our first propane bill... which adds to my motivation to get wood heat as at least part of our heating. Probably not until we buy a house... anyway let me know how it is! Hi Charlie -- I just brought home two carloads of buckthorn trunks from ten acres I cleared in East Charlotte this summer. I'm hoping to get a week's worth of heating in the spring. I love cutting it for people and it's too bad so many landowners along Route 7 are apathetic about the problem or overwhelmed and think it's hopeless. People need to appreciate work again! I know it's been a long time since you first posted this, but yesterday we just burned a nice, radiant, non-popping warm bonfire of mostly buckthorn and chinese elm invasives that had sat around in the yard since last summer. What you need to know about buckthorn is that those thorns can deliver some nasty, rash-creating sap of some kind in the fall. Just be careful! I would burn it indoors if I had a stove. It's very long burning. 19 hours later, a big pile of warm ash still making radiant heat and not a lot of smoke. Great idea! Good luck handling buckthorn as a firewood. You'll be picking thorns from your hands repeatedly. Yeah, that is true in general, even removing some from our yard got me stabbed several times. It may be better suited for mechanical removal and chipping or conversion to pellets. Though I haven't noticed thorns on the larger stems of the huge examples in Addison County. I heated for about a month, mixing 2/3 buckthorn with 1/3 hardwood, because it smoldered a bit, having been cut less than a year previous. The thorns do seem to get brittle and fall off of the firewood sized trunks. They're nastiest when the tree's a teenager - skinny without the full height and all the berries. That's the only age buckthorn I use gloves with. I started a fund to clear buckthorn between Monkton and Starksboro! Please forward, post, and donate if you can! It's earned enough for six hours so far. Work starts in September. Thanks, will do! It's great that you are working on that. Are you going to landowners and offering to do removal or is it on your own land so far? Just checking back on this thread. The anonymous contributor may not be familiar with glossy buckthorn which is not really thorny at all despite its name. The stuff that I'm cutting is very easy to handle. 49˚F this morning but I refuse to burn wood in August. Still, my half cord is ready to go. I've already cut close to that amount for the next winter's shoulder wood. The jury is still out but I'm looking forward to the experiment! Hi! Yeah, maybe 'anonymous' was dealing with younger buckthorn. I recently removed some thankfully small shrubs from our property and put them in a pile to burn, and when picking them up to toss in a little campfire it jabbed up my hand pretty good, not fun to handle. but the larger ones don't seem to have spines like you said. In any event we are now ready to heat with wood as our primary source this winter so I look forward to hearing how your half cord does and may also burn some if I find any. We now live in Montpelier where buckthorn is less abundant. Great conversation you have going here. Glad to hear about the work Dave Webb and the Low Impact Logger are doing as well. I do a good bit of buckthorn work, in my larger invasive species portfolio, and it probably would be helpful to let folks know once more that there are two invasive buckthorn species, common and glossy. I know you touched on it in your opening paragraph, but when people talk later about burning, I'm not sure which one they are using. The one with all the spiky thorns is common buckthorn. The bark is dull grey, the wood is really hard, and the plants tend to grow as multi-stemmed shrubs. At some point the shrub becomes a tree, but I'm not sure what the cutoff is. 10 inch diameter is pretty impressive buckthorn though. Nice. Anyway, this is the species that I can see working great for firewood. I also like the idea of fence-posting with it. And if you wear gloves, the spikes are no trouble, but definitely most abundant on the teenager trees. BTW, common buckthorn needs about a decade to gain maturity, but size of the shrubs can vary widely based on available sunshine. The other buckthorn, glossy, looks more like pin cherry, and I cannot see using this stuff for heat. Much softer wood, and the bark has lenticels, or broken stripes along the length of it. Also, no thorns. Glossy buckthorn fruits at a very small size - I've seen bushes of it where the diameters are less than an inch, yet there are fruits and viable seed produced. That was in full sun, so in deeper shade you'll see glossy buckthorn trees becoming 20' tall and 5 inches diameter before they fruit. Again though, although this species can grow in incredibly dense stands, I cannot see it working well as firewood. 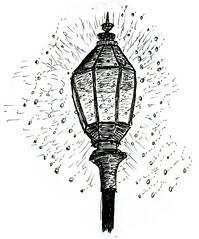 It does pull easily, when young or less than 4' tall, and it seems to favor the soil conditions found under softwood canopies. I'd also urge people to be careful when apple trees are known to be nearby. It gets a little tricky identifying common buckthorn as opposed to young apple trees. Don't want to pull apple tree seedlings if the target is buckthorn. Good luck cranking out the BTUs this winter. Also good point about apples, they do look very similar and most people wouldn't want to remove their apple trees! (They aren't native but definitely aren't invasive and if you don't want the apples the deer and turkeys do). Though, if an apple tree does need to be removed, they do make good firewood or wood for grilling. I need to learn to distinguish the different buckthorns by bark, so far I only know by leaf and that doesn't help this time of year. The bark is a pretty reliable clue Charlie, and if you get the chance, or perhaps misfortune, of seeing them side-by-side, the differences will register. Glossy has those lenticels along the stem and branches, very distinctive on the smaller shrubs, but there's definitely a bark transition as the plant matures and gets larger. The other key is that both buckthorns produce a deep purple fruit, but glossy fruits earlier than common. In general, you want to get after glossy buckthorn earlier in the growing season if you're trying to prevent seed formation. You have maybe an extra month before the common buckthorn seeds ripen, if you're lucky. Finally, I can feel a difference in the hardness of the wood while cutting. I don't often use loppers on common buckthorn over an inch diameter. But glossy is so soft, in my opinion, that the loppers work great on pretty large trunks, 2" or so. 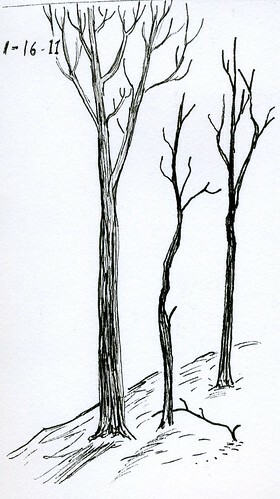 Sometimes, for the larger trees, I don't want to drop them at all since they just get in the way, so I girdle them. Glossy is easy to girdle, again with the loppers, but common is a beast. Recovers faster too. Thought that might be helpful - if you ever get to the Upper Valley you'll have plenty of both buckthorns on all sides of you. Give me a shout sometime at choosewiselyvt at gmail. I've been working this fall / winter on a comprehensive "alternative uses for common buckthorn" plan and want to share it with you and the others on this blog. I think there's some good stuff in there, but I couldn't find your email address and I don't do the Face thing. I'd welcome input - I've started some pilot versions of the ideas, but would happily support others doing the same or some variation. Mike in VT, I would love to see a copy og your alternatives, even if it is not finished. Feel free to share it! Since I wrote it, we now use a wood furnace as our primary heat source but we are blessed with a piece of land with very little buckthorn, so I don't use it in the wood stove... just burn the small stems in our fire pit sometimes, one or two made it into the maple boiling pile. Works great for that. I do think there are times when it is very very hard or impossible to get rid of it without herbicide, but haven't had to do that on our land. Was tempted with a patch of knotweed but it's rooted right next to our well, so no. Hi everybody, I am particularly interested with this topic as my woody land is being slowly but surly being replaced with glossy buckthorn. I am seriously thinking to rent or buy a wood shreader and dry the invader to burn. I modified my wood burning stove many years ago. I installed a grill under the burning wood. This modification make a big difference in oxygen feeding to the fire. Often I will fill the burning chamber with small pieces of wood and it burns pretty well. I will keep you informed. While we're no where near out the heating season left, I'm writing back to report that I heated our house exclusively with glossy buckthorn from early November right up until New Year's day. While it doesn't compare favorably to red oak, my best seat of the pants estimate is that glossy buckthorn is somewhere between paper birch and red maple on the BTU per cord scale. Most of the wood that I burned I burned in a Jøtul Nordic F100 and a 602. I bucked all pieces to 14". Diameters ranged from 2" to 8". Yes, 8" glossy buckthorn is a reality where I'm cutting and I've positively identified it as GB and not Pin Cherry. Anything over 3", I either split or partially split to allow for better drying. Drying in direct sun, all buckthorn was cut, split and stacked by March and was easily ready to burn (down to 20% moisture) by August. Depending upon the size of the load, I generally got solid 4 hour burn times with very good coals remaining in the morning for overnight loads. Wow, great info, thanks! I've gotten into tapping a few trees and boiling sap and it sounds like the small size and fairly fast drying and abundance might make buckthorn a great wood for tiny-scale sap production too! Plus it helps the maples to get rid of it. I should also mention that my source for Glossy Buckthorn is a 40 acre tract of land that I've been cutting cross country ski trails on. As Mike in Royalton VT eluded to, a lot of the buckthorn that I'm going through is almost mowable. I've been setting aside the larger diameter stuff rather than piling it as slash or chipping it. Give the scale of my operation (just me with an occasional helper) and the extent of the infestation, using a root jack on this is not practical. Thus, all buckthorn gets cut down to the stump and we've been mechanically mowing the regeneration (which is beyond impressive) and we've been successful in reducing its vigor. This is not at all a tree that I would seek out for firewood but my situation is unique and presents me with an abundant supply from which to choose. I am, without a doubt, stricken with what loggers/arborists call FAD or firewood aquisition disorder. I had been ignoring the larger pieces for years until I, just on a hunch, decided to save a few pieces to season. The rest is history. That mowing idea is really neat. I wouldn't want to have to apply round up to 40 acres of stumps, nor try to root them out of the ground. The rooting on that kind of scale would probably encourage more weeds too. You must have to cut them very low to the ground, right? I'm a part time wood turner that makes game calls (turkey, duck, goose, deer, coyote, etc). I also own a junk removal company and just did a job not so long ago. It was a brush pile and had buckthorn mixed in. I really never paid attention to the beauty of this wood before, but the orange cream color is stunning. Its closely related to the pink ivory exotic wood as a matter of fact. If you get larger piece, you could sell to wood turners like myself. Take that money and buy cheaper firewood or fuel. Anyways, the reason i wanted to chime in here is because i found out that some people get an allergic reaction to this. As a wood turner, shavings hit us all over the place and dust will be breathed in. My concern on using this as firewood would be the smoke. Now I dont know much this, but some wood when burned can cause major problems. Posion sumac one of them. But anyone with a brain knows better not to use that in a fire place. Anyways, I would be careful and do some research on this. It might not effect you or me, but it could effect someone else. Some people react differently to different woods. I break out from cocobolo wood like poison ivy, so i cant use it. Just let people be aware of the dangers. Hope this helps even though its a 2 year old post. No, that's great info, thanks! I think I've heard the wood is nice from another bowl turner, so it's a good point that it can be used for other things. As for the smoke causing problems, I have not heard of that in buckthorn, sumac and poison ivy yes, but it's possible. Anyone reading this experienced that? I imagine in a sealed wood stove it would be less of an issue. Steven: Researched your good concerns pretty extensively about the toxicity of buckthorn smoke and only found one caution about burning buckthorn in brush piles that have been treated with herbicide. Makes sense. On a personal note, I haven't had any adverse reactions to the handling of wood nor the leaves of buckthorn in spite of the fact that the leaves, bark and berries are toxic to humans. None of the folks I've worked with on clearing many acres of buckthorn have had reactions either. A good thing! Having said that, I'm not breathing in dust from turning and the saw chips that I create are most often from green wood so there's very little dust. It's good to be cautious and skeptical though. All of our stoves are clean burning and I season the heck out of our wood and so aside from the smoke that comes from adding a new charge of wood to the fire box, we're not producing any visible particulates from burning buckthorn. This could be different for a low temperature burn but I don't ever burn brush piles of buckthorn. Great topic! I own a goat rental business in Minnesota and we target using goats to set back buckthorn. They do a great job on opening up the forest so we can go in and cut up the larger stuff. Currently we are working at a local nature center with acres of older 6 to 9 inch buckthorn. We agree there has to be some good use for the wood. Last night we were at a benefit dinner for the nature and a wood turner donated a buckthorn art piece. It was so beautiful and felt really heavy in the hand. I have been told buckthorn is hard on wood turning blades. Is that true? Could this be made into furniture? I like the fence post idea above for straighter ones. I will also experiment with burning wood in my ice fishing house. The heater is small and would lend itself well to smaller buckthorn. Step 1- use fire or goats to kill seedlings and saplings. Step 2- pollard specimens 1" or larger DBH and geotag for biannual follow-up harvest. Pollarded specimens cut at breast height. Step 3- harvested wood from pollard cuts is chipped on site. Step 4- chips are used as food for edible mushroom spawn. Step 5- edible mushrooms harvested and sold for human consumption with funding being used to expand operations. Comments on this would be helpful. If such an idea proved viable, we could crowdsource seed funding for R&D. How many of you would be investors (seriously)? Wisconsin has plenty of invasive common Buckthorn. Besides the spikes, berries, and green leaves in Winter, it can be identified by scratching the bark and noting the yellow color just under the bark. After cutting I find it is best to poison the root otherwise it will sprout into a glorious Buckthorn bush. Reached the part of my woodshed this week where much of my buckthorn from two years ago was drying. (Glossy Buckthorn). I have about a cord of it for this season and it is burning beautifully. I filled the firebox last night and had a quantity of coals remaining this morning similar to what I would have had were red oak the wood of choice. Other thoughts: I've been using a chainsaw mounted sawbuck (purchased through Amazon) to process much of my buckthorn. Because of its smaller size, I find that it rolls around in a typical wood crib and so bringing single pieces through the chainsaw (a small Stihl 170) mounted on the saw horse like a chop saw is working very well. Estimated BTU value: ~23-24 million BTU's per cord given its burn characteristics. I have burned wood for much of my heat for forty years and have burned over forty species of hardwood.I work on cutting the buckthorn on my and my neighbors' land and burn most of the stems 1 1/2 to 2" and up. My goal is to reduce the buckthorn to favor native trees and shrubs. The firewood is an added plus and it burns well. I think that many property owners don't even realize how much it has taken over the plant community here in Central New York. As to it being labor-intensive to cut, I like to work in the woods and I don't pay to go to a gym for exercise.